In Travelers: The Meaningful Journey, Régent Jean Cabana takes readers on a soul-affirming journey, making a strong case that the world outside, the one we travel into, responds to the world inside, the world we carry in our hearts and souls. 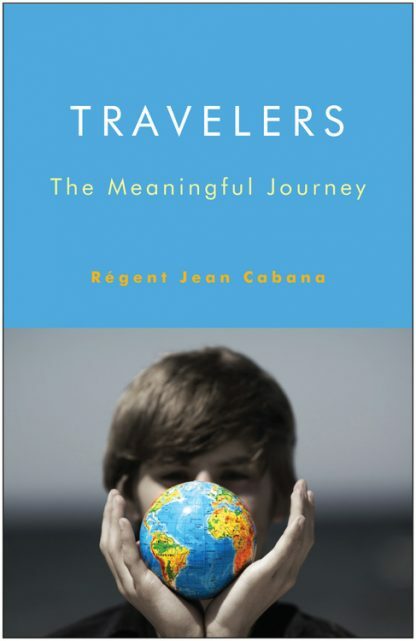 Cabana draws on both old and new age wisdom to illustrate the unique qualities of each individual traveler, while at the same time exemplifying the universal appeal and symbolic strength of the figure of “Traveler” as portrayed throughout the ages. Travelers: The Meaningful Journey teaches us that our voyages can bring a special kind of wisdom when we are open to the possibilities, and it reminds us that home is within, not without. This is a book you will want to take with you wherever you go – whether it’s on a weekend pilgrimage or a month-long sojourn. Régent Jean Cabana is a passionate Traveler. At age 33 he made his childhood dream of circling the globe a reality when he began an eighteen-month sojourn traveling solo around the world. Returning home, he conducted a prolific ethnographic research on Travelers for his Ph.D. dissertation. He teaches comparative urban sociology classes in Mexico, Brazil and Canada to American and Canadian students. He is also a consultant in academic international programs. The author describes travel as movement from one place to another or as a shift in consciousness, or both. He defines the journey as the awareness of movement, physical or psychological, and insists that the distance or the length of time incurred during the journey is irrelevant. What matters is the awareness of the journey. You will find him on Facebook at www.facebook.com/regentjeancabana.